This article is a report on a symposium sponsored by the American Society for Pharmacology and Experimental Therapeutics and held at the Experimental Biology 07 meeting in Washington, DC. The presentations discussed the phenomenology, clinical consequences, and underlying mechanisms of cytochrome P450 and drug transporter regulation by inflammatory and infectious stimuli. Although considerable insights into the links between inflammatory mediators and altered hepatic drug clearance pathways have been gained from previous studies with acute inflammatory stimuli, this symposium highlighted recent advances in understanding how these processes operate in other organs and chronic inflammatory states relevant to human diseases. The development of mouse models of live bacterial infection provides excellent opportunities to explore the impact of infection on drug metabolism beyond the well characterized effects of bacterial endotoxin. Altered levels of cytochromes P450 and especially drug transporters due to inflammation in brain, intestine, and placenta have significant implications for the use of many drugs in diverse clinical settings. The consequences of inflammatory cytokine production by tumors for drug safety and efficacy in cancer patients were outlined. Repression of drug clearance pathways by tumor-derived cytokines may result in extreme toxicity to chemotherapy, compromising treatment of many cancers. It is fitting that, in honoring the career contributions and achievements of Dr. Kenneth W. Renton, this symposium reinforced the clinical relevance of this field. Inflammation regulates the expression, activity, and functions of many drug-metabolizing enzymes and drug transporters. Although impairment of drug-metabolizing enzyme activities during inflammation has been known to occur for half a century, regulation of transporters by inflammation was recognized relatively recently, in the last decade. Although the regulation of both cytochrome P450s (P450s) and drug transporters has profound implications for clinical drug therapy in disease states, research on inflammation in drug metabolism and transporters has tended to proceed in parallel. This symposium was organized to bring the areas together to identify commonalities and differences in the regulation of transporters and drug-metabolizing enzymes and to promote cross-fertilization of knowledge. It is appropriate then, that this symposium also recognized the career and contributions of Dr. Kenneth W. Renton on the occasion of his retirement. The diverse presentations on regulation of both P450 enzymes and drug transporters revealed that the regulation of both systems in inflammation, infection, and cancer have much in common. In the face of a global inflammatory stimulus such as bacterial endotoxin [lipopolysaccharide (LPS)], most P450s and transporters are down-regulated although a few may be refractory. However, the specificity of P450 and transporter regulation depends on the inflammatory model under study. Although a number of inflammatory cytokines are capable of regulating these proteins and genes, the role of interleukin (IL)-6 in the regulation of both P450 enzymes and transporters in all models studied was highlighted. Furthermore, the regulation of basal versus drug-induced P450 and transporter expression by inflammation was shown to occur by different mechanisms. Born in Galashiels, Scotland, Ken Renton emigrated to Canada, working as a laboratory technician before attending Sir George Williams University in Montreal, where he earned a B.Sc. with Distinction. He obtained a Ph.D. in Pharmacology from McGill University and then joined the laboratory of Dr. Gil Mannering at the University of Minnesota in 1975 as a Research Associate. Two years later, he joined the faculty of the Department of Pharmacology at Dalhousie University, where he remained and served as Head from 1988 to 1995. Through his innovative thought, rigorous scientific approach, and unparalleled insight, Dr. Renton has been a leader in the field throughout his career, giving inspiration and freely dispensing wisdom to his colleagues and competitors alike. Dr. Renton's early seminal work on P450 regulation by interferons (Renton and Mannering, 1976a,b) focused attention on a field that had hitherto been characterized by sporadic observational reports, and his laboratory made many subsequent important fundamental discoveries in this area (Singh et al., 1982; Singh and Renton, 1984; Peterson and Renton, 1986; Azri and Renton, 1987; Knickle et al., 1992). In recognition of these significant contributions to the field, Dr. Renton won the Merck-Frosst Award and Medal in Pharmacology in 1987. More recently, his laboratory has focused on the regulation of both hepatic and brain P450s during CNS inflammation (Renton and Nicholson, 2000), which has great significance for the use of drugs in diseases that have an inflammatory component such as Alzheimer's and Parkinson's diseases, multiple sclerosis, and CNS trauma. In collaboration with Drs. Goralski and Piquette-Miller, he also provided the first evidence that drug transport protein expression is altered during CNS inflammation (Goralski et al., 2003). This finding has major implications for the delivery of drugs into the brain and for the toxicity of agents used during CNS inflammatory responses. It is well established that inflammatory processes (Renton, 2001) affect the metabolism, distribution, and elimination of certain drugs (Renton, 2004). These effects result from the altered expression of P450 and drug transporter proteins that are down-regulated during the generation of host defense mechanisms. This has major implications in inflammation and infection when the capacity of the liver and other organs to handle drugs is severely compromised. From studies in animals, individual P450 isozymes and P-glycoprotein (PGP) are down-regulated at the level of gene transcription with a resulting decrease in the corresponding mRNA, protein and enzyme/transporter activity (Morgan et al., 2002; Renton, 2004). The losses in drug metabolism and transport are channeled predominantly through the production of cytokines that ultimately modify the expression and function of specific transcription factors (Fig. 1). Other proposed mechanisms that apply to specific P450s involve post-translational steps including enzyme modification and increased degradation (Aitken et al., 2006). When inflammatory responses are confined to the brain there is a loss of P450 and PGP not only in the brain but also in peripheral tissues. This loss probably involves the rapid transit of inflammatory components from the brain to the peripheral circulation (Abdulla et al., 2006). Proposed pathways for the loss in drug metabolism during inflammation and infection. Inflammatory diseases stimulate the release of cytokines from monocytes, macrophages and stromal cells, resulting in the modulation of transcription factor activities in the liver. These changes ultimately lead to a down-regulation of most P450 genes. 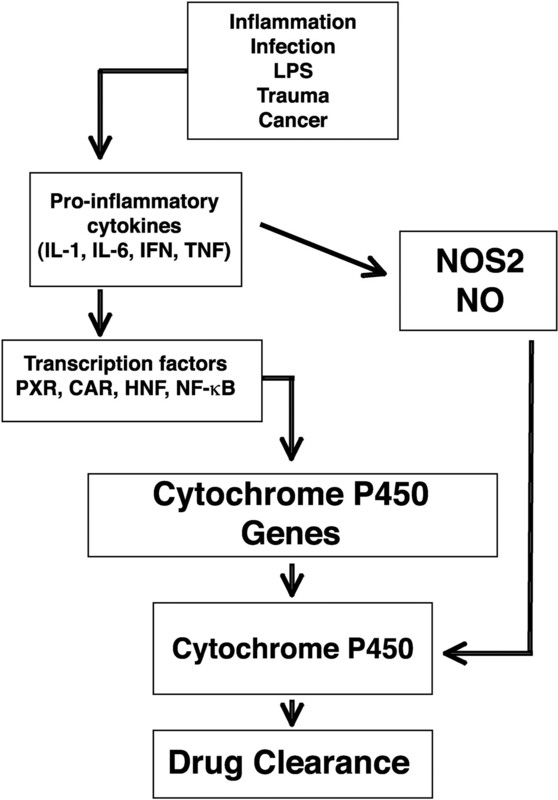 The production of cytokines also activates nitric-oxide synthase 2 (NOS2) to form nitric oxide (NO) that inhibits P450 enzyme activities directly and/or leads to the down-regulation P450 proteins via destabilization. HNF, hepatocyte nuclear factor; NF, nuclear factor. In clinical medicine there are numerous examples indicating that a decrease in the capacity to handle drugs occurs during infections and disease states that involve an inflammatory component and that this decrease leads to the subsequent development of drug toxicity (Renton, 2005). In animal models of human disease we have carried out a series of studies that show that such responses may be more common than generally reported. Also it has been shown in rodents that inflammatory responses within the CNS alter drug disposition in the brain and in peripheral systems. In a rodent model of meningitis caused by Listeria monocytogenes we have shown that several forms of P450 are down-regulated in the liver and have the potential to cause untoward drug responses (Garcia Del Busto Cano and Renton, 2003). In a model of Parkinson's disease we have shown that the 1-methyl 4-phenyl 1,2,3,6-tetrahydropyridine-evoked depletion of dopamine is enhanced after the development of inflammation in the brain (Goralski and Renton, 2004). This finding raises the possibility that a subset of human Parkinson's disease might result from exposure to certain chemicals during a period when inflammatory responses are present in the individual. The loss of P450-catalyzed metabolism during inflammation can also alter physiological responses that are dependent on P450 pathways. In rats we have shown that the production of 20-hydroxyeicosatetraenoic acid from arachidonic acid was diminished in the afferent arterioles of the kidney when the expression of CYP4A2 was down-regulated during an inflammation present in the brain. This resulted in the loss of 20-hydroxyeicosatetraenoic acid-evoked arteriole tone that leads to an increase in the glomerular filtration rate and an increase in the excretion of sodium in the urine (D. Heugan and K. W. Renton, unpublished data). Although carried out in animals these experiments suggest that human physiological functions that are dependent on P450-generated mediators are subject to alteration during periods of inflammation or infection. The distribution of morphine and its glucuronides after a brain injury caused by a subarachnoid hemorrhage. The subject received various i.v. doses of morphine as needed over a 5-day period. The concentrations of morphine (•), morphine-3-glucuronide (▵), and morphine-6-glucuronide (○) were measured in samples of CSF and blood at 12-h intervals. One of the first and most dramatic examples of P450 loss in humans occurred during the 1980 influenza epidemic in Seattle (Kraemer et al., 1982). Several young children who were receiving theophylline as prophylactic treatment for asthma were admitted to hospital with severe drug toxicity, which included convulsions and cardiac conduction anomalies. These children had received theophylline on a daily basis without problems, and the inflammatory mediators produced in response to the virus probably caused a dramatic loss in CYP1A2. As this drug was given daily, large accumulations of the drug ensued. For example, the levels of theophylline produced in a 7-year-old child with influenza increased >5-fold, and the half-life increased from 4 to >20 h compared with the same parameters measured during several clinic visits over the 2-year period before the infection. This child suffered permanent severe brain damage caused by drug-evoked convulsions. Of particular note to the use of drugs in patients with brain trauma is a recent study from our laboratory carried out in rodents, showing that the transport of some drugs across the blood-brain barrier is dramatically changed during a CNS inflammatory response (Goralski et al., 2003). This study is discussed in more detail by Dr. Goralski later in this article. This change in drug distribution can be attributed to the loss in expression of the PGP drug transporter protein within the blood-brain barrier. This allows drugs that are normally transported out of the brain by PGP to enter and cause CNS toxicity. Such changes in drug-handling capacity during inflammation/infection will continue to be one of the many factors that complicate therapeutics (Renton, 2005). In humans with severe CNS trauma (injury or surgery) an inflammatory response commonly occurs within the brain. It has also been our clinical observation that when patients with a brain injury receive morphine as part of their care, the drug is generally well tolerated for a few days, but some patients develop agitation that we believe is related to the morphine therapy. In normal circumstances morphine is metabolized in the liver to two major metabolites [morphine 3-glucuronide (M3G) and morphine 6-glucuronide (M6G)]. These metabolites are excluded to some extent by a functioning PGP in the blood-brain barrier (Letrent et al., 1999a,b). If PGP diminishes in the blood-brain barrier as a result of CNS inflammation, then these morphine metabolites will accumulate in the brain. Some support for this idea can be found in recent studies showing that the chemical inhibition of PGP increases the concentration of M6G after the administration of morphine to rats (Lötsch et al., 2002). Although M6G is more potent than morphine with similar actions, M3G is a CNS irritant and may cause the agitation observed in humans. 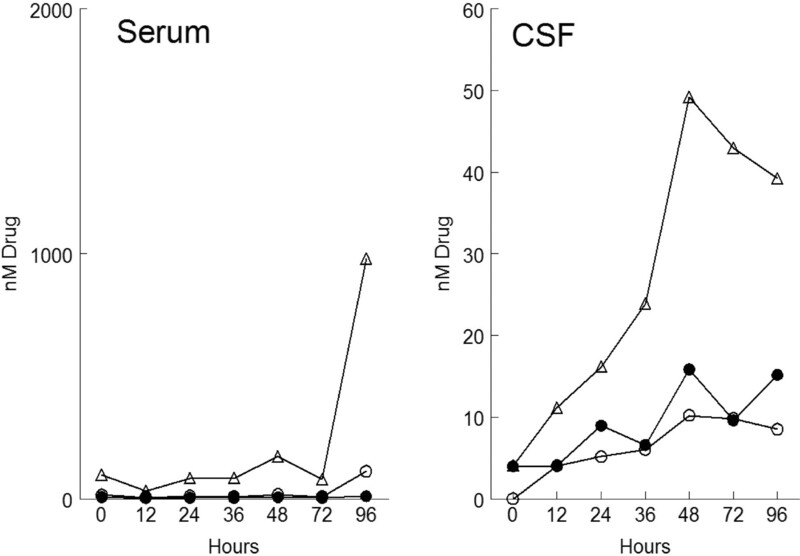 In a patient with a brain injury treated with morphine, we assessed the levels of these metabolites on both sides of the blood-brain barrier by measuring them in blood and cerebrospinal fluid (CSF) (Fig. 2). The levels of M3G appeared to accumulate in the CSF at a faster rate than that in plasma. If we can demonstrate that these metabolites increase in the CNS as a result of inflammation, this finding will have far reaching consequences for many other drugs (e.g., digoxin, cyclosporin A, and human immunodeficiency virus protease inhibitors) that are normally excluded from the brain by PGP when they are used in any condition that involves an inflammatory component within the CNS. The question about the frequency of untoward drug responses occurring as a result of inflammatory responses is difficult to answer. Many examples are probably missed because the vast majority of drugs have a wide safety margin and many pathways are not capacity limited. In addition, many patients are seriously ill during inflammatory responses and untoward drug responses might not be readily identifiable. There are, however, three conditions that can be identified to be problematic in drug use during inflammatory responses: 1) when drugs are fully dependent on P450 or PGP for disposition; 2) when drugs are dependent on both pathways for disposition; and 3) when drugs are given to an individual with already impaired drug disposition due to a genetic poor metabolism allele. In each of these instances continual drug administration could exceed the capacity of the liver and other organs to effectively deal with the normal dosage regimen and the resulting drug accumulation would lead to toxicity and in some instances a severe untoward drug response. It remains important to identify the individuals who are most likely at risk, to identify the major disease states that might cause this problem, and to identify the problematic drugs. It is also prudent to alert medical specialists about the drugs specific to their practice and suggest that they use caution in any patient with a disease state that involves an inflammatory component. A number of studies in experimental animals have shown that that live bacterial (e.g., L. monocytogenes and Mycobacterium tuberculosis), viral (e.g., Mengo virus and encephalomyocarditis virus), and parasitic (e.g., Plasmodium berghei and Schistosoma mansoni) infections are each capable of down-regulating the activities and/or expression of drug-metabolizing enzymes in the liver (Morgan, 1997; Renton, 2001; Aitken et al., 2006). These effects can be mimicked to varying extents by sterile inflammatory agents such as adjuvants, particulate or chemical irritants, and purified cytokines and interferons (Aitken et al., 2006). However, perhaps the best-characterized and understood model of inflammation, in terms of P450 regulation, is that of bacterial LPS. In contrast to most of the other above-mentioned infections or inflammatory stimuli, the effects of LPS on hepatic P450 regulation have been relatively well characterized in terms of the enzyme specificity of the effects, and much is also known about the mechanisms involved. When injected into animals, LPS stimulates monocytes and macrophages (including resident Kupffer cells in the liver) to release early proinflammatory cytokines such as tumor necrosis factor (TNF)-α and IL-1β (Sweet and Hume, 1996). In turn, these cytokines initiate an inflammatory cascade that results in release of other cytokines (including IL-6), chemokines, and eicosanoids from many different cell types in the body. Eventually, this process results in neutrophil recruitment to sites of inflammation and release of reactive oxygen species and nitric oxide, causing oxidative stress. The majority of the biological effects of LPS can be attributed to its binding to and activation of a membrane receptor complex that includes Toll-like receptor (TLR)-4 as a necessary component (Mollen et al., 2006). Many laboratories have studied the effects of injected LPS on P450 metabolism or expression in rats or mice. As outlined in previous reviews (Morgan, 1997; Renton, 2001; Aitken et al., 2006), exposure to LPS elicits the rapid and profound down-regulation of multiple P450 mRNAs in the liver. These include CYP1A2, 2A1, 2C6, 2C7, 2C11, 2C23, 2E1, 3A2, and 4F4 in the rat and 1A2, 2A5, 2C29, 2E1, 3A11, 4A10, 4A14, 4F15, and 4F16 in the mouse. P450s of the 4A subfamily are up-regulated in rat liver, but the reason for this species difference is not known. Inflammatory cytokines including TNFα, IL-1β, and IL-6 can recapitulate the down-regulation of many P450s in primary hepatocyte cultures and/or in vivo models (Morgan, 1997), but such experiments do not tell which cytokines mediate the effects of LPS. Studies in mice lacking functional genes for different cytokines or cytokine receptors have failed to identify a single cytokine responsible for the effects of LPS, suggesting possible functional cytokine redundancy in this model. In contrast, IL-6-null mice showed attenuated P450 down-regulation in inflammation induced by the local irritant turpentine (Siewert et al., 2000), pointing to an important role of circulating IL-6 in inflammation localized at a site remote from the liver. We showed that in rats treated with LPS, hepatic transcription of the CYP2C11, CYP3A2, and CYP2E1 genes was down-regulated within 1 h of injection (Cheng et al., 2003) (Fig. 3). Our laboratory and others have also demonstrated transcriptional suppression of P450s by cytokines using various reporter gene constructs in primary hepatocytes and hepatoma cells (Chen et al., 1995; Jover et al., 2002; Aitken et al., 2006). Therefore, transcriptional suppression is clearly an important contributor to P450 mRNA down-regulation. However, as noted elsewhere (Aitken et al., 2006), the rapidity with which P450 mRNAs are down-regulated in rat liver in vivo cannot be explained by this mechanism alone, and it is likely that altered mRNA stability also occurs. On the other hand, the P450 mRNA suppression is too slow to explain some changes in P450 protein expression and activity. Notably, nitric oxide-mediated enzyme inhibition (Vuppugalla and Mehvar, 2005) and NO-regulated protein degradation (Ferrari et al., 2001) contribute to the functional suppression of some P450 isoforms. Suppression of P450 gene transcription in LPS-treated rats. Rats were injected with 1 mg/kg LPS i.p., and hepatic nuclei were isolated 1 h later. Transcription of P450 and acute-phase protein genes was assessed by nuclear run-on assay. The data are taken from Fig. 1 of Cheng et al. (2003). Several laboratories have noted that the pregnane X receptor (PXR), which mediates the induction of many P450 isoforms by drugs, is down-regulated in hepatocytes by LPS or inflammatory cytokines. This down-regulation of PXR is likely to be responsible for the inflammatory down-regulation of PXR agonist-inducible P450 expression. However, PXR is unlikely to contribute to the down-regulation of P450s in the absence of drug induction, because PXR-null mice show no (Richardson and Morgan, 2005) or minimal (Teng and Piquette-Miller, 2005) attenuation of the hepatic P450 responses to LPS. A similar conclusion was reached by Drs. Goralski and Renton in a model of CNS inflammation (see below). Although the LPS model has proven to be a robust and tractable model that has greatly facilitated progress in understanding P450 regulation, at the doses employed in most studies it is a model of bacterial sepsis, a severe systemic infection with a high mortality rate. Moreover, endotoxemia is only one facet of a bacterial infection, and thus the P450 expression observed in the LPS model may not accurately mirror the response to a live infection, especially a mild one. As noted above, studies in knockout mice indicate that cytokines act redundantly to down-regulate P450s in the LPS model, but roles of individual cytokines (e.g., IL-6) can be discerned in local inflammatory models. Also, work in cultured hepatocytes demonstrated that P450s are differentially sensitive to cytokines. This led us to hypothesize that the pattern of P450 regulation in a live model of bacterial infection would be different from that in the LPS model. To test our hypothesis, we studied the regulation of hepatic P450s in a mouse model of human enteropathogenic Escherichia coli infection. Citrobacter rodentium is a murine pathogen that colonizes the colons of infected mice and elicits colonic inflammation and pathological changes that are highly similar to that caused by enteropathogenic E. coli. Moreover, the virulence genes are interchangeable between the two species. C. rodentium infection is also considered to be a good model for inflammatory bowel diseases, which affect more than 1 million people in North America. Regulation of P450 mRNAs in the livers of mice infected with C. rodentium. Four- to 5-week-old female C3H/HeOuJ (HeOu) or C3H/HeJ (HeJ) mice were infected with 2 × 108C. rodentium cells by gavage, and their livers were harvested 7 days later for measurement of P450 mRNA expression by reverse-transcriptase real-time polymerase chain reaction. Data were normalized to the expression of glyceraldehyde 3-phosphate dehydrogenase in the samples. Control animals were pair-fed. *, significantly different from control (p < 0.05, t test). With the exception of CYP2B9, the data are summarized from Figs. 1 and 2 of Richardson et al. (2006). In HeOu mice bearing a functional TLR4, C. rodentium infection caused a selective down-regulation of some hepatic P450 isoforms (Richardson et al., 2006) (Fig. 4). The mRNA levels of CYP4A10 and CYP4A14 were profoundly down-regulated, to <5% of control values. CYP2B9, CYP2C29, and CYP3A11 mRNAs exhibited an intermediate down-regulation, CYP1A2, CYP2E1, and CYP3A13 mRNA levels were unaffected, and CYP2A5 mRNA was induced by 80% (Fig. 4). CYP4F18 was induced by approximately 6-fold (Richardson et al., 2006). The relatively selective regulation of P450s in this model is in marked contrast to the LPS model, in which most P450 mRNAs are down-regulated, and so these results support our hypothesis described above. We also tested the role of TLR4 in the response of hepatic P450s to C. rodentium infection, by repeating the experiment in HeJ mice that lack a functional TLR4. As shown in Fig. 4, the absence of functional TLR4 did not attenuate the down-regulation of P450s seen in HeOu mice, but it did block the induction of CYP2A5 (Richardson et al., 2006). These findings indicate that C. rodentium-mediated down-regulation of hepatic P450 mRNAs is independent of TLR4 activation. Conversely, the failure of C. rodentium to induce CYP2A5 mRNA in HeJ mice suggests that the induction seen in HeOu animals is likely to be dependent on bacterial LPS signaling via TLR4. The significance of the observation that CYP1A2 and 2E1 mRNAs were suppressed in the HeJ mice but not in the HeOu strain is presently unclear. The involvement of C. rodentium LPS acting via other pattern recognition receptors such as TLR2 in P450 down-regulation remains to be determined. Although HeOu mice are an appropriate control for the HeJ strain, HeOu is known to be particularly sensitive to C. rodentium pathogenicity. Thus, some animals in the above study died before their livers could be harvested. We are currently characterizing the regulation of P450 expression by C. rodentium infection in C57/BL6 mice, which are more resistant to C. rodentium pathology and morbidity. Our preliminary results suggest that the pattern and specificity of the regulation is maintained in the C57/BL6 strain. Thus, the mouse will be an excellent model to study disease-specific P450 regulation and also to study the role of P450 enzymes in the host response to infection by enteropathogenic bacteria. The inherent lack of safety of cytotoxic anticancer drugs due to adverse events from toxicity in normal tissues is an intrinsic problem of chemotherapy. The wide variability in response to anticancer drugs, with some cancer patients experiencing extreme toxicity, whereas others do not gain benefit from the same dosing regimen, highlights the need for better treatment strategies designed to reduce side effects while maximizing killing of malignant cells. Currently, estimation of appropriate dosage based on body surface area is a crude approach that does not account for the wide interindividual differences in drug clearance exhibited by cancer patients. Much of the interpatient variability in the clearance of anticancer drugs can be attributed to differences in the levels of drug-metabolizing enzymes, especially CYP3A4. CYP3A4 is responsible for the metabolism of many important classes of anticancer drugs, including the taxanes, vinca alkaloids, camptothecins, cyclophosphamide, etoposide, tamoxifen, and newer agents such as imatinib and gefitinib. One potential source of interindividual variability in CYP3A-mediated drug metabolism is the genetic diversity in human CYP3A genes. However, recent studies in cancer patients have found that single nucleotide polymorphisms in the CYP3A4 gene are unlikely to make a significant contribution to differences in CYP3A activity relevant to chemotherapy, as assessed by erythromycin breath test, midazolam clearance, or paclitaxel pharmacokinetics (Baker et al., 2004; Henningsson et al., 2005; Lepper et al., 2005). Therefore, it is important to elucidate the impact of one other source of variability in hepatic drug metabolism, namely cancer-induced inflammation, as it is present in at least 60% of patients with advanced cancer. Previous studies by our group found that patients with advanced cancer have significantly reduced CYP3A4 activity associated with increased plasma concentrations of inflammatory mediators, in particular IL-6 and C-reactive protein (Slaviero et al., 2003). As discussed in the previous section, studies in IL-6-null mice have implicated this cytokine in hepatic P450 regulation in some inflammatory models. Importantly, impaired CYP3A4-mediated clearance was correlated with increased toxicity to docetaxel or vinorelbine (Slaviero et al., 2003). Although these clinical studies have established a relationship between extrahepatic tumors and reduced levels of hepatic CYP3A4 activity, surrogate markers of enzyme activity were used, which did not identify the level (transcriptional, post-transcriptional, or catalytic) at which repression operates. Because of the difficulties associated with obtaining human liver tissue to explore this further, we used a novel transgenic mouse model incorporating the 13-kilobase upstream regulatory region of human CYP3A4 linked to the convenient lacZ reporter gene (Robertson et al., 2003). Implantation of a xenograft model of a solid tumor, the Engelbreth-Holm-Schwarm (EHS) sarcoma, into the quadriceps muscle of CYP3A4/lacZ transgenic mice resulted in reduced hepatic levels of the transgene-derived β-galactosidase as shown by histochemical staining with X-Gal and quantification using the o-nitrophenyl-β-d-galactopyranoside assay (Charles et al., 2006) (Fig. 5). This result provides the first direct evidence for the transcriptional down-regulation of human drug-metabolizing genes by solid tumors outside the liver. The levels of the mouse CYP3A11 mRNA and CYP3A proteins were also found to be reduced in tumor-bearing mice, demonstrating that murine equivalents of the human CYP3A4 transgene were also down-regulated (Charles et al., 2006). The functional outcome of reduced transcription of mouse Cyp3a genes was examined using the midazolam sleep test as an indicator of CYP3A activity. In mice the predominant pathway of midazolam clearance is hepatic CYP3A-mediated 1′-hydroxylation. Midazolam-induced sleep time was more than doubled in tumor-bearing mice, consistent with the decrease in CYP3A protein (Charles et al., 2006). Therefore, growth of a tumor results in a functionally relevant alteration in the pharmacokinetics/pharmacodynamics of a CYP3A substrate. The involvement of cytokines, especially IL-6, in the repression of CYP3A and CYP2B mRNA levels has been extensively studied using models of acute inflammation in rodents (Aitken et al., 2006). To determine whether IL-6 is associated with the tumor-associated repression of human CYP3A4 in the EHS sarcoma model, the circulating levels of IL-6 were examined. Plasma IL-6 was found to be 25 pg/ml in tumor-bearing mice, whereas in control mice, IL-6 could not be detected (Charles et al., 2006). If IL-6 is involved in CYP3A repression associated with tumors, an important issue is the cellular source of IL-6 production. Kupffer cells in the liver may release IL-6 in response to tumor-derived cytokines, such as IL-1β or TNFα. Local hepatic production of IL-6 by Kupffer cells may then elicit CYP3A repression in hepatocytes. However, IL-1β and TNFα could not be detected in the plasma of EHS tumor-bearing mice and IL-6 protein could not be detected by immunostaining of livers from tumor-bearing mice. In contrast, EHS tumors contained abundant IL-6 protein (Charles et al., 2006). Additional clinical evidence for IL-6 as a tumor-derived cytokine comes from analysis of prostate and colorectal cancers, which showed IL-6 protein actually within malignant cells of tumors (Royuela et al., 2004; Brozek et al., 2005). Other features of the inflammatory-type response in the livers of EHS tumor mice were characterized. As mice do not have a direct equivalent of human C-reactive protein, hepatic expression of another acute-phase protein, serum amyloid P (SAP) was analyzed, with an 8-fold increase in SAP mRNA levels apparent in the livers of EHS tumor-bearing mice (Charles et al., 2006). Alterations in components of the IL-6 signaling cascade were also characterized. The levels of phosphorylated signal transducer and activator of transcription (STAT)-3 were higher, consistent with an observed increase in suppressor of cytokine signaling 3 mRNA, a direct STAT-3 target gene. Elevated phosphorylation of mitogen-activated protein kinase-related proteins extracellular signal-regulated kinase 1/2 and c-Jun N-terminal kinase was also evident. Taken together, these results show marked stimulation of the IL-6 signaling pathway in livers of EHS tumor-bearing mice concomitant with repression of CYP3A expression. To explore whether this association between tumor-associated cytokines such as IL-6 and repression of CYP gene transcription is a generalized feature of tumor growth, a number of other mouse tumor models were examined. Murine CYP3A11 mRNA was similarly reduced in the livers of mice with the breast EO771, melanoma B16, and colon 38 tumors. Midazolam sleep times were also increased, reinforcing the concept that growth of diverse tumors can have significant effects on CYP3A-mediated clearance of drugs. Circulating concentrations of IL-6 were elevated alongside increased hepatic expression of SAP mRNA in breast EO771 and melanoma B16 tumor-bearing mice to levels similar to those observed in EHS tumor-bearing mice. Therefore, the links between tumor-derived cytokines and reduced hepatic drug metabolism may be a feature of several common malignancies. The expression of other P450s and phase II enzymes was also characterized in the livers of EHS tumor-bearing mice. CYP2B10 mRNA is dramatically reduced, whereas CYP27A1 mRNA is approximately halved. Proteomic profiling was performed by multiplexed tandem mass spectrometry (tandem mass spectrometry-time of flight) after iTRAQ labeling. CYP1A2 and CYP2D9 proteins are reduced, CYP2C39 is increased, and a number of other P450s including CYP2C37, CYP2D10, CYP2D26, CYP2A12, and CYP2E1 did not show significant changes. With regard to phase II enzymes: eight glutathione S-transferases were identified with six reduced and two unchanged; sulfotransferase 1A1 increased while sulfotransferase 2A1 was reduced; UDP-glucuronosyltransferase 2B5 was reduced, and no change was observed in UDP-glucuronosyltransferase1A7. Apart from P450s and phase II enzymes, reductions in hepatic transporters are observed in inflammatory states and after LPS treatment (Teng and Piquette-Miller, 2005; Aitken et al., 2006). The resulting functional defects in multidrug resistance protein (Mdr) 1a activity in acute inflammation are manifest by reduced hepatic transport of doxorubicin and 99mTc-labeled sestamibi (Hartmann et al., 2005; Wang et al., 2005). We therefore examined the expression of a number of transport protein genes in the livers of EHS tumor-bearing mice. Significant reductions were observed in the mRNA levels of Mdr2, multidrug resistance-associated protein (Mrp) 2, Mrp3, Na+-dependent taurocholate cotransporting polypeptide (Ntcp), organic anion transporting polypeptide (Oatp) 2, bile salt export pump (Bsep), and breast cancer resistance protein (Bcrp/ABCG8), whereas Mdr1a and Oatp1 were unchanged. Given the contribution that these transport proteins make to the hepatic clearance of anticancer drugs, it will be important to determine whether repression of hepatic transport proteins by tumor-derived cytokines is also linked with variable drug clearance and resulting toxicity in cancer patients. Of particular relevance to cancer treatment, the finding of down-regulation of hepatic drug transporters in the presence of tumors has significant ramifications for the management of multidrug resistance in chemotherapy because of the opposing, well characterized up-regulation of MDR1/PGP and MRPs within the tumors of some patients. Model for the repression of CYP3A-mediated drug clearance by tumor-derived cytokines. 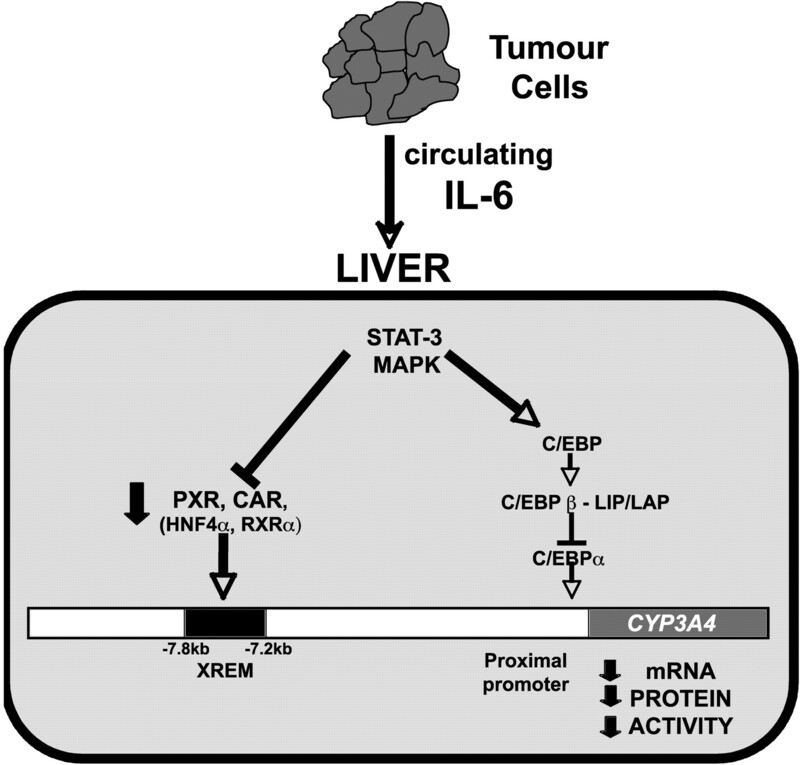 Release of cytokines such as IL-6 into the systemic circulation from tumors represses transcription of the CYP3A4 gene in the liver, resulting in reduced CYP3A4 mRNA, protein, and ultimately activity. Cytokine signaling may affect nuclear receptor-mediated regulation of CYP3A4 directly via PXR or CAR or by affecting the action of RXRα and/or HNF4α. Alternatively, IL-6 can disrupt the balance of the activating (liver-enriched activator protein) or inhibitory (liver-enriched inhibitory protein) isoforms of C/EBPβ, thereby interfering with C/EBPα regulation of CYP3A4. HNF, hepatocyte nuclear factor; RXR, retinoid X receptor; XREM, xenobiotic response enhancer module; C/EBP, CCAAT/enhancer binding protein; kb, kilobase. CYP3A4 and many of the other genes whose expression is repressed in tumor-bearing mice are regulated by nuclear receptors such as PXR and the constitutive androstane receptor (CAR). To explore the hepatic action of PXR and CAR in the presence of cancer, induction of the CYP3A4/lacZ transgene was assessed in EHS tumor-bearing mice after administration of the PXR- and CAR-specific ligands pre-genolone-16α-carbonitrile and 1,4-bis[2-(3,5-dichloropyridyloxy)]-benzene. The PXR and CAR responses were reduced in the livers of tumor-bearing mice, indicating impaired action of nuclear receptors involved in regulating drug clearance pathways consistent with results from acute inflammatory models (Beigneux et al., 2002; Teng and Piquette-Miller, 2005). In summary, pharmacokinetic studies in cancer patients as well as the results of experiments presented here using explant tumor models in humanized CYP3A4/lacZ transgenic mice have found associations between elevated acute-phase responses, cytokines, and repression of hepatic drug clearance in the presence of cancer (Fig. 6). A better understanding of the links between tumor-derived cytokines, signaling pathways in the liver and the regulation of genes encoding hepatic P450s, and phase II and transporter proteins may help identify those patients with elevated inflammatory markers who are at risk of experiencing extreme toxicity to anticancer drugs. Besides identifying predictive biomarkers for treatment response, this may also lead to the development of anti-inflammatory interventions with the aim of normalizing drug metabolism and disposition, thereby minimizing adverse reactions to chemotherapy. The PGP (Mdr1) drug efflux transporter is a major biochemical component of the blood-brain drug permeability barrier that limits the accumulation of several drugs (Table 1) in the CNS (Schinkel et al., 1995; Beaulieu et al., 1997; Goralski et al., 2003, 2006). It is well known that neuroinflammatory diseases including bacterial infections, head injury, human immunodeficiency virus dementia, multiple sclerosis, Alzheimer's and Parkinson's disease change the permeability characteristics of the blood-brain barrier (de Vries et al., 1997). We have hypothesized that conditions with an associated CNS inflammatory component alter PGP drug transport across the blood-brain barrier. As illustrated in Dr. Renton's section, a reduction in PGP function may increase the risk for harmful drug interactions or toxicity produced by CNS-acting drugs, such as morphine and its biologically active metabolites. Reviewed in Petrovic et al. (2007). To model CNS inflammation we used intracerebroventricular (i.c.v.) injection of E. coli LPS, as this bacterial cell wall component is the major stimulus for inflammatory responses in the CNS caused by Gram-negative meningeal pathogens (Scheld et al., 2002). In rodents, i.c.v. administration of LPS produces a robust inflammatory response in the brain characterized by the activation of microglia and astrocytes and induction of inflammatory cytokine (TNFα, IL-6, and IL-1β) production (Renton and Nicholson, 2000; Nicholson and Renton, 2001; Goralski et al., 2003, 2005). In rats, we have demonstrated a rapid reduction in the expression of brain Mdr1a mRNA that was maximal at 6 h after i.c.v. LPS administration (Goralski et al., 2003). Consistent with the loss in Mdr1a expression, we observed an increased accumulation of the PGP substrate [3H]digoxin in the brain when that drug was administered peripherally (Goralski et al., 2003). Taken together these results are consistent with the idea that localized CNS inflammation produces a loss of PGP function in the blood-brain barrier. We repeated the [3H]digoxin distribution study in Mdr1a-expressing (Mdr1a+/+) and Mdr1a-deficient (Mdr1a–/–) mice to confirm that the increased digoxin accumulation in the brain was Mdr1a-dependent. Treatment of Mdr1a+/+ mice with i.c.v. LPS caused a 2-fold increase in brain digoxin compared with the saline controls (Goralski et al., 2003). In contrast, we were surprised to find that Mdr1a–/– mice treated with i.c.v. LPS displayed a reduction in [3H]digoxin in the brain compared with the saline-injected Mdr1a–/– mice (Goralski et al., 2003). This intriguing result suggested that in addition to reducing the function of PGP, CNS inflammation may also down-regulate carrier-mediated drug uptake processes in the blood-brain barrier. As discussed in Dr. Piquette-Miller's section, LPS-induced systemic inflammation produced a similar time-dependent reduction in brain Mdr1a mRNA and protein levels and function of the PGP transporter (Wang et al., 2005). Of importance, this finding displays the fact that blood-brain barrier PGP expression and function are modifiable by systemic inflammation as well as CNS inflammatory responses. As noted in the section by Dr. Morgan et al., TLR4 has been identified as the transmembrane receptor that specifically recognizes LPS and initiates an inflammatory signaling response to that bacterial cell wall component (Poltorak et al., 1998). Recent work by Hartz et al. (2006) has shown that activation of TLR4 signaling is the major pathway involved in the rapid reversible loss in PGP expression and activity in isolated rat brain capillaries treated with LPS (Hartz et al., 2006). In the intact animal, activation of TLR4 receptor signaling within the circumventricular organs, the choroid plexus and the leptomeninges leads to a well organized inflammatory response during cerebral injury or systemic Gram-negative bacterial infection (Laflamme and Rivest, 2001). Thus, the activation of TLR4 signaling could trigger the reduction in brain mdr1a and PGP function after central administration of LPS. To test this hypothesis, LPS (2.5 μg) was administered i.c.v. to TLR4-expressing mice (C3H/HeouJ) and mice (C3H/HeJ) with mutated nonfunctional TLR4. The TLR4-expressing mice demonstrated a 50% reduction in brain Mdr1a expression 4 h after i.c.v. LPS (Fig. 7A). By 24 h after LPS administration, brain Mdr1a expression returned to control levels (Fig. 7B). In comparison, i.c.v. LPS did not reduce brain Mdr1a expression in mice with mutated TLR4 (Fig. 7, A and B). This result confirms that activation of TLR4 receptor signaling is the major pathway involved in reduction of brain Mdr1a expression during LPS-induced CNS inflammation. In isolated rat brain capillaries, TLR4 activation by LPS stimulates TNFα release, which activates the TNF-receptor 1, which in turn stimulates endothlin-1 release, and sequential activation of the endothelin-1B receptor, nitric oxide synthase, and protein kinase C causing a rapid and reversible loss in PGP transport function (Hartz et al., 2006). In the brains of TLR4-expressing mice but not those of TLR4-deficient mice we observed an induction of the inflammatory cytokines TNFα and IL-6 mRNA (Fig. 7, C and D). Thus, it is likely that inflammatory cytokine-mediated pathways are also important for modulation of Mdr1a expression in vivo. Effect of i.c.v. LPS on the expression of Mdr1a in the brains of TLR4-expressing and TLR4 mutant mice. 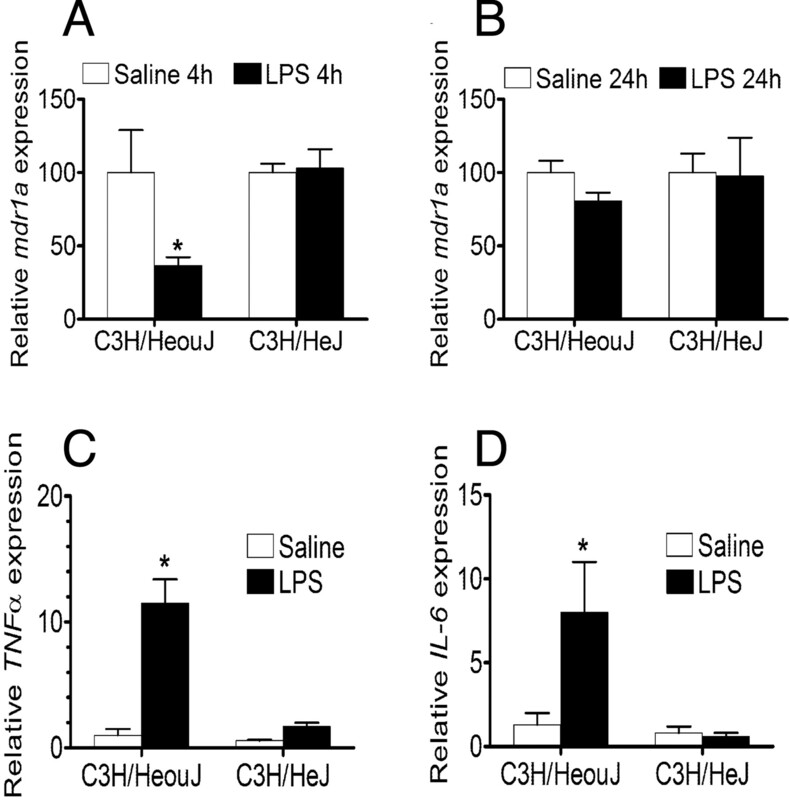 Wild-type (C3H/HeouJ) and TLR4 mutant (C3H/HeJ) mice were injected with 2.5 μg of LPS or 2.5 μl of saline into the lateral cerebral ventricle. Total RNA was isolated from brain cortex 4 or 24 h after the saline or LPS injections. Mdr1a (A and B), TNFα (C), and IL-6 (D) expression were measured by quantitative polymerase chain reaction and expressed as a percentage of the respective saline control. Each bar represents the mean expression ± S.E.M. of three or four samples. *, p < 0.05 compared with the respective saline control (analysis of variance, followed by Tukey's honestly significant difference test). The combined actions of CYP3A metabolism and PGP drug efflux play a major role in the hepatocyte detoxification and biliary elimination of many therapeutic agents. As described in the sections by Drs. Morgan et al., Robertson et al., and Piquette-Miller, peripheral inflammatory responses inhibit hepatic CYP3A and PGP drug elimination pathways. The recent studies highlighted in Dr. Renton's section have demonstrated that inflammatory responses originating in the CNS reduce the capacity of the liver to metabolize drugs via CYP1A, 2B, 2D, and 2E pathways (Renton and Nicholson, 2000; Nicholson and Renton, 2001). After this we hypothesized that LPS-induced CNS inflammation leads to an impairment of hepatic PGP and CYP3A expression and function resulting in reduced systemic drug elimination. When i.c.v. LPS-treated rats were administered [3H]digoxin by i.p. injection as a probe for PGP function at discrete time points, we observed increased plasma levels of that drug compared with the non-LPS-treated controls (Goralski et al., 2003). The increased plasma digoxin levels in LPS-treated rats could be attributed to a reduction in PGP-mediated biliary clearance, which was maintained for at least 48 h after induction of CNS inflammation (Goralski et al., 2003). Our finding of increased plasma digoxin levels in i.c.v. LPS-versus saline-treated Mdr1a+/+ mice but not in LPS-versus saline-treated Mdr1a–/– mice strongly supported the fact that reduced Mdr1a/PGP was the major factor leading to the altered plasma pharmacokinetics of digoxin in this model of CNS inflammation. In addition to the reduction in hepatic PGP function, hepatic CYP3A11 expression and metabolic activity was decreased by 60 to 70%, 24 h after i.c.v. administration of LPS to mice (Goralski et al., 2005). The loss in CYP3A11 expression was observed in TLR4-expressing but not in TLR4-deficient mice, indicating that TLR4 pathways were directly involved in the enzyme loss (Goralski et al., 2005). A similar loss of hepatic CYP3A11 expression and activity was observed after i.c.v. LPS administration to adrenalectomized mice, whereas the i.c.v. injection of TNFα did not produce a reduction in hepatic CYP3A11 expression or function (Goralski et al., 2005). Thus, the activation of the hypothalamic-pituitary-adrenal axis and serum corticosteroids and the transfer of inflammatory cytokines from the CNS to the circulation were not likely mechanisms linking CNS inflammation with reduced CYP3A11 drug metabolism by the liver. PXR is a xenobiotic sensor that activates the expression of CYP3A as well as a number of other transporter proteins and P450 enzymes in the liver. In a previous report, systemic LPS treatment decreased PXR expression, suggesting involvement of this receptor in the reduction of hepatic CYP3A expression and function during inflammatory responses (Beigneux et al., 2002). In our study, LPS-induced CNS inflammation produced a time-dependent reduction in hepatic CYP3A11 expression (Fig. 8A) and activity (Fig. 8B) that was similar in PXR+/+ and PXR–/– mice. These results indicated that PXR does not have a primary role in the loss of basal levels of hepatic CYP3A11 expression and function in a model of CNS inflammation. This result consists largely with two recent studies that evaluated the effect of systemic inflammation on the loss of hepatic CYP3A11 mRNA in PXR-deficient mice (Richardson and Morgan, 2005; Teng and Piquette-Miller, 2005). We have recently identified that some LPS is rapidly transferred from the brain into the circulation after the central administration of that drug (Goralski et al., 2005). Thus, during a bacterial infection in the CNS, the distribution of LPS from the brain to the circulation would most likely stimulate a peripheral inflammatory response that evokes a reduction in drug elimination by the liver. In summary, because many clinically used drugs are both transported by PGP and metabolized by CYP3A4, the combined effects of CNS inflammation on these two important drug elimination mechanisms, could contribute to substantial reductions in overall drug detoxification by the liver. Furthermore, the reduction of PGP function in the blood-brain barrier is a very important physiological change as it could allow for drugs to breach the blood-brain barrier, leading to drug toxicity in CNS inflammatory diseases. On the contrary, factors that selectively reduce PGP function in the blood-brain barrier could have potential therapeutic benefit when the desired goal is to enhance drug delivery to the brain. Effect of i.c.v. 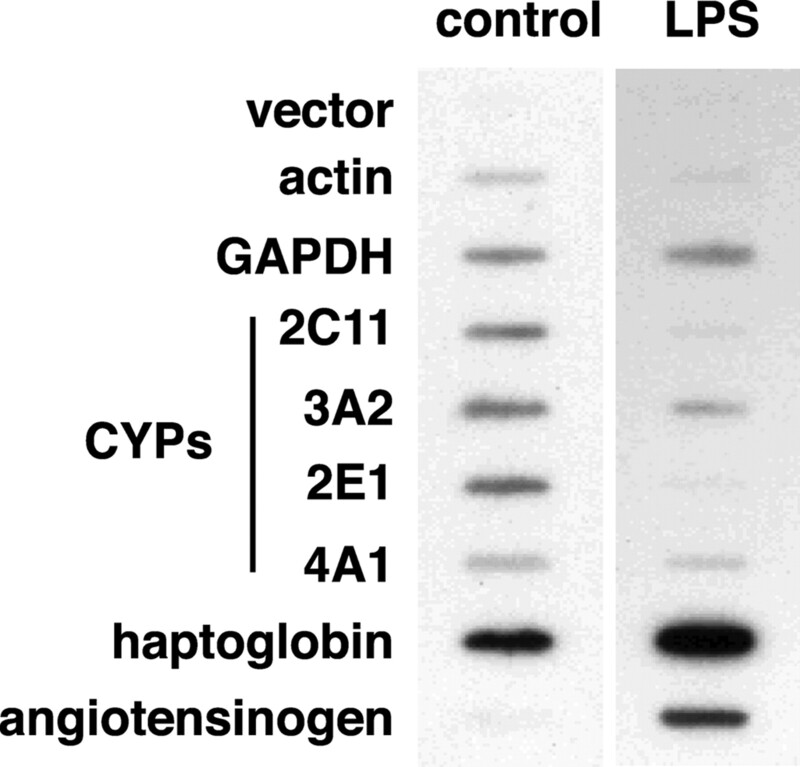 LPS on the expression and function of hepatic CYP3A11 in PXR+/+ and PXR–/– mice. Wild-type (PXR+/+) and knockout (PXR–/–) mice were injected with 2.5 μg of LPS or 2.5 μl of saline into the lateral cerebral ventricle. RNA was isolated from liver 8, 24, 36, or 48 h after the saline or LPS injections. Cyp3a11 mRNA expression (A) was measured by Northern blot, normalized to glyceraldehyde-3-phosphate dehydrogenase and expressed relative to the respective PXR+/+ saline-treated control within each time group. CYP3A11 enzyme activity in hepatic microsomes (B) was measured by the metabolism of triazolam to α-hydroxytriazolam (Goralski et al., 2005). Each bar represents the mean expression ± S.E.M. of three to six samples. 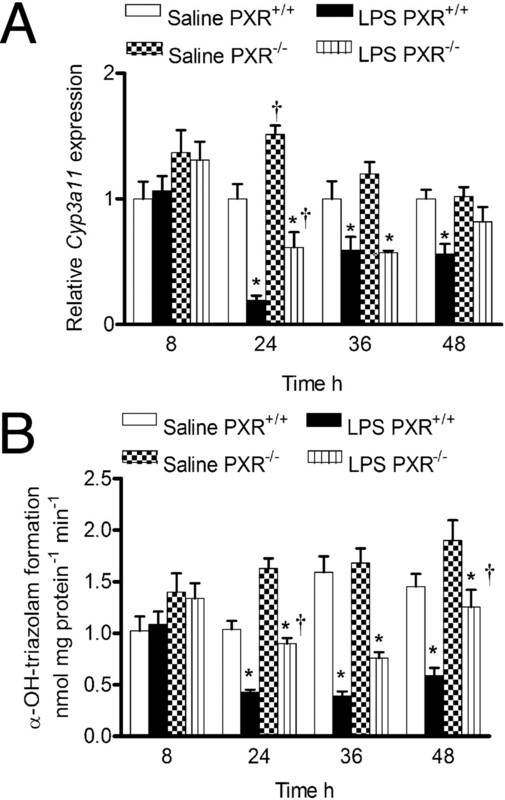 *, p < 0.05 compared with the respective PXR+/+ or PXR–/– saline controls within each time group; †, p < 0.05 compared with the respective saline or LPS-treated PXR+/+ mice within each time group (analysis of variance, followed by Tukey's honestly significant difference test). In humans and animals, stress-evoking stimuli such as infection, hypoxia, and injury result in a classic inflammatory response due to the induction of cytokines and other inflammatory mediators. Over the past 30 years there have been numerous reports of inflammation-associated changes in plasma drug concentrations and toxicity, and thus many studies have examined the underlying mechanisms responsible for this phenomenon (reviewed in Slaviero et al., 2003; Renton, 2005; Aitken et al., 2006; Petrovic et al., 2007). Much of the work to date has ascribed these changes to alterations in drug-metabolizing enzymes and drug-plasma binding proteins. However, studies over the past decade have also identified inflammation-mediated changes in the expression and activity of membrane transporters, which may contribute to alterations in the absorption, distribution and clearance of drugs. There are several classes of membrane transport proteins that are involved in the transport of xenobiotics. Of particular importance are the ABC drug efflux transporters that include P-glycoprotein (PGP/ABCB1), which is encoded by the multidrug resistance gene MDR1 in humans and Mdr1a and Mdr1b in rodents, the multidrug resistance-associated proteins (MRP1–3/ABCC1–3), and the breast cancer resistance protein (BCRP/ABCG2). Largely known for their involvement in the extrusion of antineoplastic agents from tumor cells and development of multidrug resistance, a great deal of substrate overlap exists between PGP, BCRP, and the MRP transporters. Highly expressed in epithelia of the intestine, liver, kidney, placenta, and blood-brain barrier, these ABC drug transporters serve a key role in the disposition of many clinically important drugs and their metabolites (Table 1). In addition, members of the organic anion-transporting peptide (OATP, Slc21) family, in particular OATP1 and OATP2, are important in the cellular uptake and oral bioavailability of a broad spectrum of anionic drug substrates. Impact of Inflammation on Hepatic Transporters. Classic models of the inflammatory response are elicited locally through a small s.c. injection of turpentine oil or systemically using bacterial endotoxin (LPS) in rodents. Administration of these agents triggers the release of the proinflammatory cytokines IL-6, IL-1β, and TNFα and elicits numerous changes in hepatic protein production, which are felt to reflect the acute phase response observed in humans. Pronounced changes in the hepatic expression of the ABC transporters have been reported with both LPS and turpentine models (Piquette-Miller et al., 1998; Tang et al., 2000; Hartmann et al., 2001, 2002). Initial studies detected decreases of 50 to 70% in the hepatic expression and activity of PGP within 24 to 48 h after administration of turpentine (Piquette-Miller et al., 1998). These reductions, which occurred at the level of mRNA, were shown to stem from suppression of Mdr1a and Mdr1b nuclear gene transcription in turpentine-treated rats (Sukhai et al., 2000). Endotoxin administration has also been shown to alter the expression of several ABC transporters (Table 2) with some divergent effects seen. For example, although Mdr1b mRNA levels are decreased in mice, levels are increased in rats. Nevertheless in both species, a decreased PGP protein expression is seen (Tang et al., 2000; Hartmann et al., 2001; Goralski et al., 2003). Subsequent pharmacokinetic studies confirmed the fact that inflammation-mediated decreases in the hepatic expression of Mdr1a/PGP in endotoxin-treated mice and rats were associated with corresponding changes in function and significant reductions in the hepatic accumulation and biliary clearance of model substrates including doxorubicin and 99mTc-sestamibi (Hartmann et al., 2005; Wang et al., 2005). The proinflammatory cytokines are known to play a principal role in the regulation of numerous hepatic proteins during inflammation. Thus, it was postulated that the down-regulation of drug transporters probably occurred through these cytokine-mediated pathways. Indeed, in vivo studies demonstrated a down-regulation in the hepatic expression of Mdr1a, Mdr1b, and Mrp2 as well as the Oatp transporters in IL-6-treated mice, thereby suggesting involvement of IL-6 in the inflammatory-mediated down-regulation of the ABC transporters (Hartmann et al., 2001, 2002). Likewise, in vitro treatments with IL-6 decreased the expression and activity of PGP/MDR1 in both primary cultured rat and human hepatoma cells (Sukhai et al., 2000; Lee and Piquette-Miller, 2001). IL-1β was also found to contribute to PGP suppression; however, a pronounced induction in Mdr1b expression was seen in mice treated with TNFα (Hartmann et al., 2001). Thus, differential effects of cytokines on Mdr1 expression may be responsible for discrepancies between models of inflammation. Regulation in Extrahepatic Tissues. In vivo studies have demonstrated a pronounced reduction in the mRNA and protein expression of PGP/Mdr1a, Mrp2, and CYP3A in the jejunum of endotoxin-treated rats (Kalitsky-Szirtes et al., 2004). This down-regulation is associated with an increased mucosal to serosal absorption of PGP and MRP2 substrates across the intestinal sections isolated from endotoxin-treated rats. Endotoxin-induced down-regulation of PGP/Mdr1a in brain tissues has also been found to increase intracranial drug accumulation in rodents. Increased accumulation of doxorubicin, which corresponded to decreased PGP protein expression, was observed in the brains of endotoxin-treated mice (Hartmann et al., 2005). Likewise, systemic and CNS inflammation produced by i.p. or intracranial administration of endotoxin triggered significant decreases in the expression of Mdr1a mRNA in rat brain with analogous increases in the brain accumulation of PGP substrates such as 99mTc-sestamibi and digoxin (Goralski et al., 2003; Wang et al., 2005). Similar to liver, inflammation also resulted in a pronounced decrease of Oatp2 in brain (Goralski et al., 2003). Recent reports have also demonstrated down-regulation of several drug transporters in the placenta of endotoxin-treated rats. Systemic, endotoxin-induced inflammation in near-term pregnant rats imposes a dose- and time-dependent down-regulation in the mRNA levels of several placental transporters, including Bcrp, Mdr1a, Mdr1b, Mrp1, Mrp2, Mrp3, and Oatp2 (J. H. Wang and M. Piquette-Miller, unpublished results). Expression of drug transporters may be a key determinant of fetal drug exposure as the placenta is the principal maternal-fetal membrane barrier. Indeed, endotoxin-mediated down-regulation in placental expression of mdr1a/PGP is associated with pronounced increases in the fetal accumulation of the radiolabeled PGP substrate, 99mTc-sestamibi (Wang et al., 2005). Further experiments are needed to examine the impact of inflammation-mediated suppression of other transporters on fetal exposure to potentially harmful drugs and chemicals. Potential Regulatory Mechanisms. Putative binding sites for several “stress” transcription factors are found on the promoter sequences of the BCRP, MDR1, and MRP genes. In particular, nuclear factor-κB and nuclear factor-IL6 [also known as CCAAT/enhancer binding protein (C/EBPβ)] are induced by the proinflammatory cytokines and are considered to be major transcription factors responsible for regulation of hepatic proteins during the acute-phase response. In vivo and in vitro studies in the laboratory have demonstrated that decreased PGP expression primarily stems from an IL-6-mediated reduction in transcription of the Mdr1a and Mdr1b genes (Sukhai et al., 2000). Promoter construct activity assays and electrophoretic mobility shift assays have detected altered binding of hepatic nuclear proteins to the rat Mdr1b promoter after endotoxin administration and a novel promoter-binding region required for basal transcription has been identified (Ho and Piquette-Miller, 2007). Thus, transcriptional control through these transcription factors may provide cellular signaling pathways by which inflammatory mediators suppress expression of the ABC transporters. More recently, nuclear hormone receptors have emerged as potentially important regulators of drug transporters during inflammation. It is well established that activation of PXR in response to hormones, bile acids, and xenobiotics leads to the induction of several genes including Mdr1a, Cyp3A11, Mrp2, Mrp3, and Oatp2. Decreases in the expression of PXR and the nuclear receptor CAR are seen in the tissues of rodents and humans after exposure to LPS. As PXR activation results in the induction of many of the same drug transporter and P450 enzymes that are suppressed during inflammation, it was hypothesized that PXR could be involved in down-regulatory pathways. Indeed, studies in our laboratory detected substantial changes in LPS- and IL-6-mediated down-regulation of Bsep, Mrp2, Oatp2, and Cyp3a11 in PXR–/–-null mice compared with wild-type PXR+/+ mice (Teng and Piquette-Miller, 2005). Moreover, administration of LPS or IL-6 was found to attenuate induction of Bsep, Mrp2, and Cyp3a11 in mice pretreated with potent PXR activators (pregnenolone 16α-carbonitrile and RU486). Overall, these studies demonstrated a partial role of PXR in the down-regulation of hepatic drug transport and metabolic proteins during inflammation. As CAR and PXR have many overlapping regulatory functions, future studies will examine the involvement of CAR in inflammation-mediated changes. In conclusion, whereas elucidation of the impact of inflammation-induced changes in transporter expression on drug disposition is still in its infancy, an ever increasing amount of research suggests that alterations in the expression and activity of drug transporters contribute to inflammation-mediated changes in drug disposition. Because ABC drug transporters such as PGP, MRPs, and BCRP transport a large array of drugs, there is much potential for inflammation-induced changes in the pharmacokinetic and pharmacodynamic disposition of drugs. Studies on other classes of drug transporters may yield further information. However, at this time there is a substantial need for clinical studies, as findings from animal or tissue models cannot fully be translated to humans. This work was supported in part by U.S. Public Health Service Grants GM069971 and DK072372 (E.T.M. ), Canadian Institute of Health Research Operating Grants (M.P.-M. and K.W.R), Australian National Health and Medical Research Council Grant 352419 (G.R.R. ), and the Dalhousie University Pharmacy Endowment Fund (K.B.G.). E.T.M., K.B.G., M.P.-M., K.W.R., and G.R.R. contributed equally to this work. ABBREVIATIONS: P450, cytochrome P450; LPS, lipopolysaccharide; IL, interleukin; CNS, central nervous system; PGP, P-glycoprotein; M3G, morphine 3-glucuronide; M6G, morphine 6-glucuronide; CSF, cerebrospinal fluid; TNF, tumor necrosis factor; TLR, toll-like receptor; PXR, pregnane X receptor; EHS, Engelbreth-Holm-Schwarm; SAP, serum amyloid P; STAT, signal transducer and activator of transcription; Mdr/MDR, multidrug resistance protein; Mrp/MRP, multidrug resistance-associated protein; Oatp, organic anion transporting polypeptide; CAR, constitutive androstane receptor; i.c.v., intracerebroventricular; ABC, ATP-binding cassette; RU486, 17β-hydroxy-11β-[4-dimethylamino phenyl]-17α-[1-propynyl]estra-4,9-dien-3-one. Abdulla D, Goralski KB, and Renton KW (2006) The regulation of cytochrome P450 2E1 during LPS-induced inflammation in the rat. Toxicol Appl Pharmacol 216: 1–10. Aitken AE, Richardson TA, and Morgan ET (2006) Regulation of drug-metabolizing enzymes and transporters in inflammation. Annu Rev Pharmacol Toxicol 46: 123–149. Azri S, and Renton KW (1987) Depression of murine hepatic mixed function oxidase during infection with Listeria monocytogenes. J Pharmacol Exp Ther 243: 1089–1094. Baker SD, van Schaik RH, Rivory LP, Ten Tije AJ, Dinh K, Graveland WJ, Schenk PW, Charles KA, Clarke SJ, Carducci MA, et al. (2004) Factors affecting cytochrome P-450 3A activity in cancer patients. Clin Cancer Res 10: 8341–8350. Beaulieu E, Demeule M, Ghitescu L, and Beliveau R (1997) P-glycoprotein is strongly expressed in the luminal membranes of the endothelium of blood vessels in the brain. Biochem J 326 (Pt 2): 539–544. 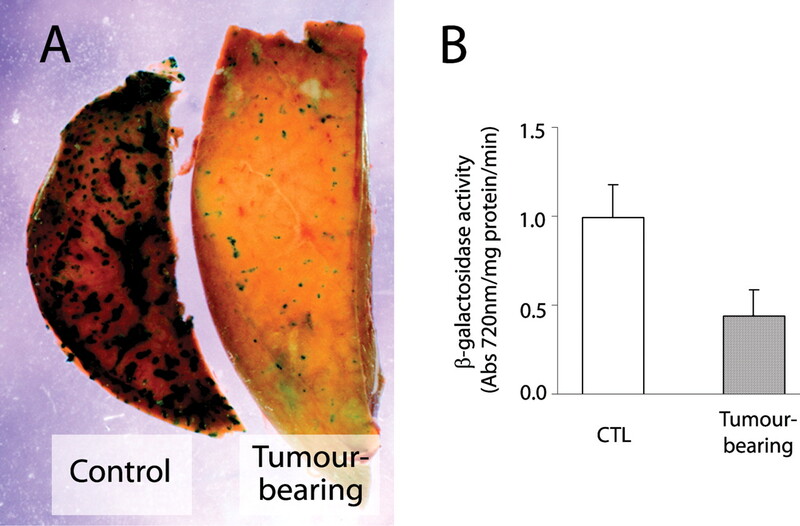 Beigneux AP, Moser AH, Shigenaga JK, Grunfeld C, and Feingold KR (2002) Reduction in cytochrome P-450 enzyme expression is associated with repression of CAR (constitutive androstane receptor) and PXR (pregnane X receptor) in mouse liver during the acute phase response. Biochem Biophys Res Commun 293: 145–149. Brozek W, Bises G, Girsch T, Cross HS, Kaiser HE, and Peterlik M (2005) Differentiation-dependent expression and mitogenic action of interleukin-6 in human colon carcinoma cells: relevance for tumour progression. Eur J Cancer 41: 2347–2354. Charles KA, Rivory LP, Brown SL, Liddle C, Clarke SJ, and Robertson GR (2006) Transcriptional repression of hepatic cytochrome P450 3A4 gene in the presence of cancer. Clin Cancer Res 12: 7492–7497. Chen JQ, Strom A, Gustafsson JA, and Morgan ET (1995) Suppression of the constitutive expression of cytochrome P-450 2C11 by cytokines and interferons in primary cultures of rat hepatocytes: comparison with induction of acute-phase genes and demonstration that CYP2C11 promoter sequences are involved in the suppressive response to interleukins 1 and 6. Mol Pharmacol 47: 940–947. Cheng PY, Wang M, and Morgan ET (2003) Rapid transcriptional suppression of rat cytochrome P450 genes by endotoxin treatment and its inhibition by curcumin. J Pharmacol Exp Ther 307: 1205–1212. de Vries HE, Kuiper J, de Boer AG, Van Berkel TJ, and Breimer DD (1997) The blood-brain barrier in neuroinflammatory diseases. Pharmacol Rev 49: 143–155. Ferrari L, Peng N, Halpert JR, and Morgan ET (2001) Role of nitric oxide in down-regulation of CYP2B1 protein, but not RNA, in primary cultures of rat hepatocytes. Mol Pharmacol 60: 209–216. Garcia Del Busto Cano E and Renton KW (2003) Modulation of hepatic cytochrome P450 during Listeria monocytogenes infection of the brain. J Pharm Sci 92: 1860–1868. Goralski KB, Abdulla D, Sinal CJ, Arsenault A, and Renton KW (2005) Toll-like receptor-4 regulation of hepatic Cyp3a11 metabolism in a mouse model of LPS-induced CNS inflammation. Am J Physiol 289: G434–G443. Goralski KB, Acott PD, Fraser AD, Worth D, and Sinal CJ (2006) Brain cyclosporin A levels are determined by ontogenic regulation of mdr1a expression. Drug Metab Dispos 34: 288–295. Goralski KB, Hartmann G, Piquette-Miller M, and Renton KW (2003) Downregulation of mdr1a expression in the brain and liver during CNS inflammation alters the in vivo disposition of digoxin. Br J Pharmacol 139: 35–48. Goralski KB and Renton KW (2004) Brain inflammation enhances 1-methyl-4-phenylpyridinium-evoked neurotoxicity in rats. Toxicol Appl Pharmacol 196: 381–389. Hartmann G, Cheung AK, and Piquette-Miller M (2002) Inflammatory cytokines, but not bile acids, regulate expression of murine hepatic anion transporters in endotoxemia. J Pharmacol Exp Ther 303: 273–281. Hartmann G, Kim H, and Piquette-Miller M (2001) Regulation of the hepatic multidrug resistance gene expression by endotoxin and inflammatory cytokines in mice. Int Immunopharmacol 1: 189–199. Hartmann G, Vassileva V, and Piquette-Miller M (2005) Impact of endotoxin-induced changes in P-glycoprotein expression on disposition of doxorubicin in mice. Drug Metab Dispos 33: 820–828. Hartz AM, Bauer B, Fricker G, and Miller DS (2006) Rapid modulation of P-glycoprotein-mediated transport at the blood-brain barrier by tumor necrosis factor-α and lipopolysaccharide. Mol Pharmacol 69: 462–470. Henningsson A, Marsh S, Loos WJ, Karlsson MO, Garsa A, Mross K, Mielke S, Vigano L, Locatelli A, Verweij J, et al. (2005) Association of CYP2C8, CYP3A4, CYP3A5, and ABCB1 polymorphisms with the pharmacokinetics of paclitaxel. Clin Cancer Res 11: 8097–8104. Ho EA and Piquette-Miller M (2007) KLF6 and HSF4 transcriptionally regulate multidrug resistance transporters during inflammation. Biochem Biophys Res Commun 353: 679–685. Jover R, Bort R, Gómez-Lechón MJ, and Castell JV (2002) Down-regulation of human CYP3A4 by the inflammatory signal interleukin 6: molecular mechanism and transcription factors involved. FASEB J 16: 1799–1801. Kalitsky-Szirtes J, Shayeganpour A, Brocks DR, and Piquette-Miller M (2004) Suppression of drug-metabolizing enzymes and efflux transporters in the intestine of endotoxin-treated rats. Drug Metab Dispos 32: 20–27. Knickle LC, Spencer DF, and Renton KW (1992) The suppression of hepatic cytochrome P4504A mRNA mediated by the interferon inducer polyinosinic acid · polycytidylic acid. Biochem Pharmacol 44: 604–608. Kraemer MJ, Furukawa CT, Koup JR, Shapiro GG, Pierson WE, and Bierman CW (1982) Altered theophylline clearance during an influenza B outbreak. Pediatrics 69: 476–480. Laflamme N and Rivest S (2001) Toll-like receptor 4: the missing link of the cerebral innate immune response triggered by circulating gram-negative bacterial cell wall components. FASEB J 15: 155–163. Lee G and Piquette-Miller M (2001) Influence of IL-6 on MDR and MRP-mediated multidrug resistance in human hepatoma cells. Can J Physiol Pharmacol 79: 876–884. Lepper ER, Baker SD, Permenter M, Ries N, van Schaik RH, Schenk PW, Price DK, Ahn D, Smith NF, Cusatis G, et al. (2005) Effect of common CYP3A4 and CYP3A5 variants on the pharmacokinetics of the cytochrome P450 3A phenotyping probe midazolam in cancer patients. Clin Cancer Res 11: 7398–7404. Letrent SP, Pollack GM, Brouwer KR, and Brouwer KL (1999a) Effects of a potent and specific P-glycoprotein inhibitor on the blood-brain barrier distribution and antinociceptive effect of morphine in the rat. Drug Metab Dispos 27: 827–834. Letrent SP, Polli JW, Humphreys JE, Pollack GM, Brouwer KR, and Brouwer KL (1999b) P-glycoprotein-mediated transport of morphine in brain capillary endothelial cells. Biochem Pharmacol 58: 951–957. Lötsch J, Schmidt R, Vetter G, Schmidt H, Niederberger E, Geisslinger G, and Tegeder I (2002) Increased CNS uptake and enhanced antinociception of morphine-6-glucuronide in rats after inhibition of P-glycoprotein. J Neurochem 83: 241–248. Mollen KP, Anand RJ, Tsung A, Prince JM, Levy RM, and Billiar TR (2006) Emerging paradigm: Toll-like receptor 4-sentinel for the detection of tissue damage. Shock 26: 430–437. Morgan ET (1997) Regulation of cytochromes P450 during inflammation and infection. Drug Metab Rev 29: 1129–1188. Morgan ET, Li-Masters T, and Cheng PY (2002) Mechanisms of cytochrome P450 regulation by inflammatory mediators. Toxicology 181–182: 207–210. Nicholson TE and Renton KW (2001) Role of cytokines in the lipopolysaccharide-evoked depression of cytochrome P450 in the brain and liver. Biochem Pharmacol 62: 1709–1717. Peterson TC and Renton KW (1986) Kupffer cell factor mediated depression of hepatic parenchymal cell cytochrome P-450. Biochem Pharmacol 35: 1491–1497. Petrovic V, Teng S, and Piquette-Miller M (2007) Regulation of drug transporters during infection and inflammation. Mol Interv 7: 99–111. Piquette-Miller M, Pak A, Kim H, Anari R, and Shahzamani A (1998) Decreased expression and activity of P-glycoprotein in rat liver during acute inflammation. Pharmacol Res 15: 706–711. Poltorak A, He X, Smirnova I, Liu MY, Van Huffel C, Du X, Birdwell D, Alejos E, Silva M, Galanos C, et al. (1998) Defective LPS signaling in C3H/HeJ and C57BL/10ScCr mice: mutations in Tlr4 gene. Science 282: 2085–2088. Renton KW (2001) Alteration of drug biotransformation and elimination during infection and inflammation. Pharmacol Ther 92: 147–163. Renton KW (2004) Cytochrome P450 regulation and drug biotransformation during inflammation and infection. Curr Drug Metab 5: 235–243. Renton KW (2005) Regulation of drug metabolism and disposition during inflammation and infection. Expert Opin Drug Metab Toxicol 1: 629–640. Renton KW and Mannering GJ (1976a) Depression of hepatic cytochrome P-450-dependent monooxygenase systems with administered interferon inducing agents. Biochem Biophys Res Commun 73: 343–348. Renton KW and Mannering GJ (1976b) Depression of the hepatic cytochrome P-450 monooxygenase system by administered tilorone (2,7-bis(2-(diethylamino)ethoxy)fluoren-9-one dihydrochloride). Drug Metab Dispos 4: 223–231. Renton KW and Nicholson TE (2000) Hepatic and central nervous system cytochrome P450 are down-regulated during lipopolysaccharide-evoked localized inflammation in brain. J Pharmacol Exp Ther 294: 524–530. Richardson TA and Morgan ET (2005) Hepatic cytochrome P450 gene regulation during endotoxin-induced inflammation in nuclear receptor knockout mice. J Pharmacol Exp Ther 314: 703–709. Richardson TA, Sherman M, Antonovic L, Kardar SS, Strobel HW, Kalman D, and Morgan ET (2006) Hepatic and renal cytochrome P450 gene regulation during Citrobacter rodentium infection in wild-type and Toll-like receptor 4 mutant mice. Drug Metab Dispos 34: 354–360. Robertson GR, Field J, Goodwin B, Bierach S, Tran M, Lehnert A, and Liddle C (2003) Transgenic mouse models of human CYP3A4 gene regulation. Mol Pharmacol 64: 42–50. Royuela M, Ricote M, Parsons MS, Garcia-Tunon I, Paniagua R, and de Miguel MP (2004) Immunohistochemical analysis of the IL-6 family of cytokines and their receptors in benign, hyperplastic, and malignant human prostate. J Pathol 202: 41–49. Scheld WM, Koedel U, Nathan B, and Pfister HW (2002) Pathophysiology of bacterial meningitis: mechanism(s) of neuronal injury. J Infect Dis 186 (Suppl 2): S225–S233. Schinkel AH, Wagenaar E, van Deemter L, Mol CA, and Borst P (1995) Absence of the mdr1a P-glycoprotein in mice affects tissue distribution and pharmacokinetics of dexamethasone, digoxin, and cyclosporin A. J Clin Invest 96: 1698–1705. Siewert E, Bort R, Kluge R, Heinrich PC, Castell J, and Jover R (2000) Hepatic cytochrome P450 down-regulation during aseptic inflammation in the mouse is interleukin 6 dependent. Hepatology 32: 49–55. Singh G and Renton KW (1984) Inhibition of the synthesis of hepatic cytochrome P-450 by the interferon-inducing agent poly rI · rCi. Can J Physiol Pharmacol 62: 379–383. Singh G, Renton KW, and Stebbing N (1982) Homogeneous interferon from E. coli depresses hepatic cytochrome P-450 and drug biotransformation. Biochem Biophys Res Commun 106: 1256–1261. Slaviero KA, Clarke SJ, and Rivory LP (2003) Inflammatory response: an unrecognised source of variability in the pharmacokinetics and pharmacodynamics of cancer chemotherapy. Lancet Oncol 4: 224–232. Sukhai M, Yong A, Kalitsky J, and Piquette-Miller M (2000) Inflammation and interleukin-6 mediate reductions in the hepatic expression and transcription of the mdr1a and mdr1b Genes. Mol Cell Biol Res Commun 4: 248–256. Sweet MJ and Hume DA (1996) Endotoxin signal transduction in macrophages. J Leukoc Biol 60: 8–26. Tang W, Yi C, Kalitsky J, and Piquette-Miller M (2000) Endotoxin downregulates hepatic expression of P-glycoprotein and MRP2 in 2-acetylaminofluorene-treated rats. Mol Cell Biol Res Commun 4: 90–97. Teng S and Piquette-Miller M (2005) The involvement of the pregnane X receptor in hepatic gene regulation during inflammation in mice. J Pharmacol Exp Ther 312: 841–848. Vuppugalla R and Mehvar R (2005) Enzyme-selective effects of nitric oxide on affinity and maximum velocity of various rat cytochromes P450. Drug Metab Dispos 32: 1446–1454. Wang JH, Scollard DA, Teng S, Reilly RM, and Piquette-Miller M (2005) Detection of P-glycoprotein activity in endotoxemic rats by 99mTc-sestamibi imaging. J Nucl Med 46: 1537–1545.